Tamesha Hervonne McNeil of Bennettsville, SC and Zandarr Spry of Marion, SC were united in marriage on June 4, 2016 in the chapel in Myrtle Beach, South Carolina. Rev. M. F. Anderson officiated. The bride is the daughter of Tammy McNeil and Herbert McNeil. The groom is the son of Linda Williams. The Bride’s attendants included Amy Bell of Anderson, SC and Zoi Spry of Columbia, SC. The Groom’s attendants included Keito Jordon and Jay Whitmore of Columbia, SC and Tre’Von McNeil of Bennettsville, SC. 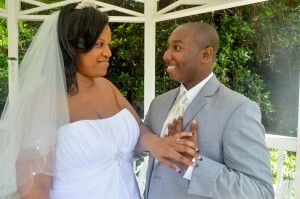 After a honeymoon in Mytle Beach, SC the couple will reside in Columbia, SC.